13.6 million people living in the watershed grew to national concern, prompting the U.S. Environmental Protection Agency (EPA) to set strict total maximum daily load (TMDL) regulations limiting nutrient emissions. Meeting those regulatory requirements effectively has remained a challenge for many farmers, wastewater managers, and local governments in the region. In a recent joint study, the World Resources Institute (WRI; Washington, D.C.) and the Chesapeake Bay Foundation (CBF; Annapolis, Md.) estimate that nutrients in urban stormwater runoff contribute only about 17% of incoming nutrients to the Chesapeake Bay. However, current efforts to manage stormwater proactively account for up to 67% of total Chesapeake Bay pollution management costs incurred by the six states in the watershed. The current business model for local governments is unsustainable. To help ease the financial burden and improve results, authors of the study recommend the inclusion of stormwater managers in new and existing nutrient credit trading programs. Nutrient trading programs usually operate as an open marketplace where runoff producers that reduce their nutrient emissions below their TMDL earn “credits” from regulators. The producers can sell these credits to others in the Chesapeake Bay region for any price they deem appropriate. Likewise, runoff producers who struggle to meet their own regulatory obligations can purchase nutrient credits from sellers; this system is intended to ensure that collective conservation goals are met while incentivizing sustainable land management. In the Chesapeake Bay watershed, the stormwater sector largely has been absent from nutrient trading programs. WRI and CBF researchers explored the existing legal, social, and economic frameworks of stormwater nutrient trading in three counties: Queen Anne’s County, Md. ; Montgomery County, Md. ; and Arlington County, Va. While no stormwater authorities in any of the studied counties yet had completed trades, the survey revealed three key factors necessary for the meaningful success of stormwater-based credit programs. First, state regulators should have a clear regulatory framework in place that shows a connection between regional stormwater credit trading and compliance with local Municipal Separate Storm Sewer System (MS4) permit requirements. In Maryland, state stormwater regulations pre-date regional obligations set for the benefit of the Chesapeake Bay. As a result, the researchers found many municipalities were unsure whether or not they were allowed legally to apply Chesapeake Bay-focused stormwater credits to meet MS4 permit requirements. On the other hand, narrowly tailored Virginia state laws quantify nutrient reduction requirements within existing MS4 permits, and even include a provision allowing stormwater managers to buy and sell nutrient credits. Second, researchers found that comprehensive guidelines for nutrient credit trading were crucial for program engagement. 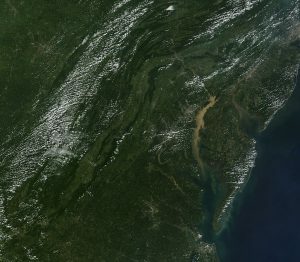 At the outset of the study, Maryland had no rules in place to guide nutrient credit trading, but has since adopted an interim policy allowing Phase II MS4s and non-regulated stormwater jurisdictions to purchase nutrient credits as a means of meeting up to 50% of their Chesapeake Bay-related obligations. Lastly, case studies in both states found effective outreach to the agricultural community to be vital. Runoff-friendly land management practices by farmers often generate more buyable nutrient credits than other producers. The researchers suggest that preserving open and transparent lines of communication, keeping “sales pitches” focused on personal agency and economic benefit, and using third-party intermediaries trusted by farmers could maximize confidence while minimizing skepticism. 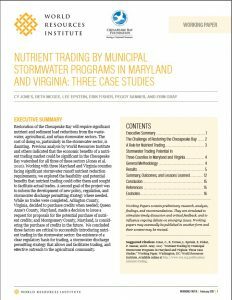 Read the full report, Nutrient Trading by Municipal Stormwater Programs in Maryland and Virginia: Three Case Studies, at the World Resources Institute website.